A family fave! Fresh herbs and bright flavors are great for a side dish or potluck addition. Everyone in my family makes this dish with a different spin on it. Get creative! Combine all ingredients for dressing and whisk in a bowl. Mix all prepared veggies to the cooked and cooled quinoa. 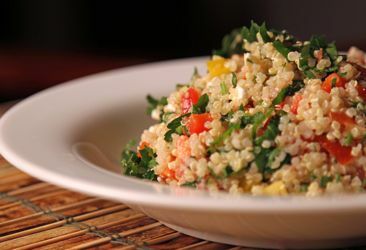 Add dressing to quinoa, add more sea salt and lemon juice to taste. Chill for 20 minutes or eat at room temp.